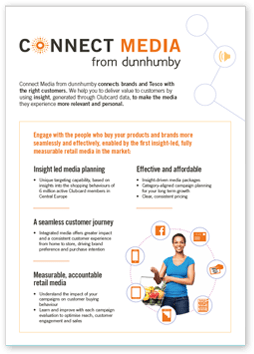 Connect Media from dunnhumby connects brands and Tesco CE with the right customers, helping you to deliver value by using insight, generated through Clubcard data, to make the media they experience more relevant and personal. Connect Media is your partner for branded, in-store campaigns with Tesco in Central Europe. Take a look at the different capabilities on offer and the benefits you can achieve. Insight led media planning Unique targeting capability, based on insights into the shopping behaviours of 6 million active Clubcard members in Central Europe. A seamless customer journey Integrated media offers greater impact and a consistent customer experience from home to store, driving brand preference and purchase intention. Measurable, accountable retail media Understand the impact of your campaigns on customer buying behavior. Learn and improve with each campaign evaluation to optimise reach, customer engagement and sales. Effective and affordable Insight-driven media packages. Category-aligned campaign planning for your long term growth. Clear, consistent pricing. Using actual shopping data to get a complete understanding of the customer. Incorporating insight & data science expertise into a customer-first media planning process. 25 years' experience in understanding and engaging with customers through personalised experiences.